When flying into the Midland airport in West Texas, there was no doubt that I had arrived in oil country. It was a pleasant March afternoon and I could see drilling rigs on either side of the airport runway. Pump jacks were nodding in every direction as far as my eyes could see. In a few short years, growth from the Permian Basin has catapulted the United States into the world’s largest crude oil producer, surpassing both Saudi Arabia and Russia in 2018. Over the past year alone, crude oil production from the Permian Basin grew by almost one million bbls/d. The EIA expects total production from the area will reach nearly 4.2 million bbls/d this month, supplying over four per cent of global demand. Not only has the United States taken the lead position for global oil production, it has also taken the crown. The Permian Basin is now the largest oilfield in the world. Saudi Arabia’s famous Ghawar oilfield was thought to produce about five million bbls/d, however the big public reveal by Aramco last week showed that the giant field’s output has declined to 3.8 million bbls/d, well behind the Permian. The Midland airport is near the centre of the Permian’s two major oil producing sub basins; the Midland Basin to the east and the Delaware Basin to the west. 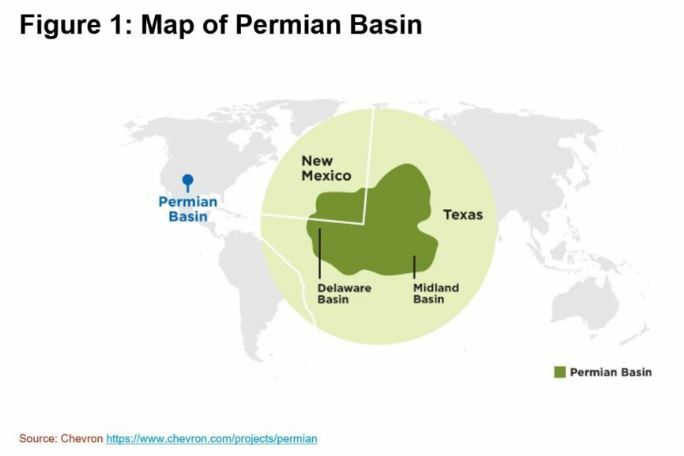 The surface area of the Permian Basin is a bit larger than Washington State, with about 80 per cent of the surface area in Texas and the rest in New Mexico (see Figure 1). Permian oil was first discovered in the early 1920s. The first production peak was in the mid-1970s, reaching about 700,000 bbls/d. But the next 30 years, “maturity” set in. Investment and production declined as a result of stagnant technology and weaker oil prices. Long-time locals still remember the difficult lessons learned from this prolonged oil market downturn, making them wary of overbuilding during the boom times. While Permian pessimists tend to focus on the constraints to growth — including water, takeaway capacity and people — the locals insist that solutions are coming. For fracking water, the use of subsurface “produced water” is becoming more common, providing a vast water source because the producing wells have high water cuts. While both oil and natural gas takeaway capacity out of the region has been tight, existing pipelines are adding capacity and greenfield projects are under construction. Although local workers are hard to find in a boomtown, an army of new workers is arriving from other regions of the United States, and lately from Canada. Work camps, known as “man camps” in West Texas, are popping-up to house the region’s growing shadow population. Some of the world’s largest oil producers are stepping-up their investment in the Permian Basin. Collectively, the crude oil output of Shell, Exxon, BP, Chevron and ConocoPhilips could grow by 1.5 million bbls/d over the next several years. Larger, independent oil producers are also investing, including Anadarko, Devon, EOG and Occidental. These larger companies are better positioned to fund their Permian growth and they are likely to bring new innovation to the basin. Their research and development expertise should increase oil recovery rates; their larger scale should push down costs; plus they may have better success at applying digital innovations to reduce cost and find more oil. There are concerns that productivity in the region could slow, because of resource limitations and subsurface technical issues, but the innovation and investment capital brought by larger companies could help to offset some of these trends. There are plenty of naysayers on the potential for the Permian to keep growing. However, betting against this West Texas powerhouse hasn’t been a good call over the last few years. 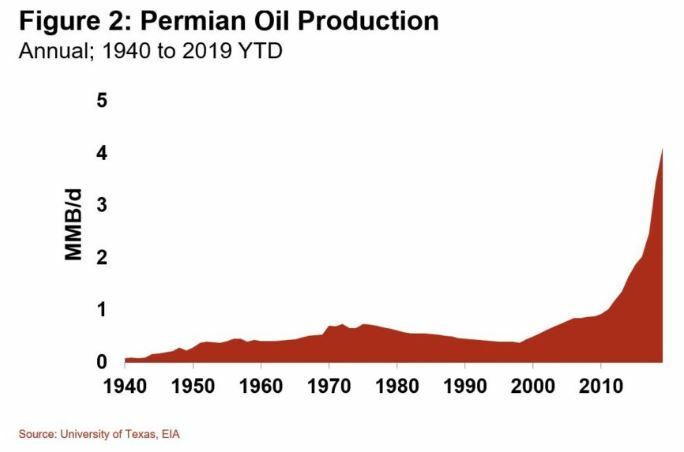 And while there is admittedly plenty of uncertainty, my on-the-ground wager is that the Permian will keep growing for some time to come.